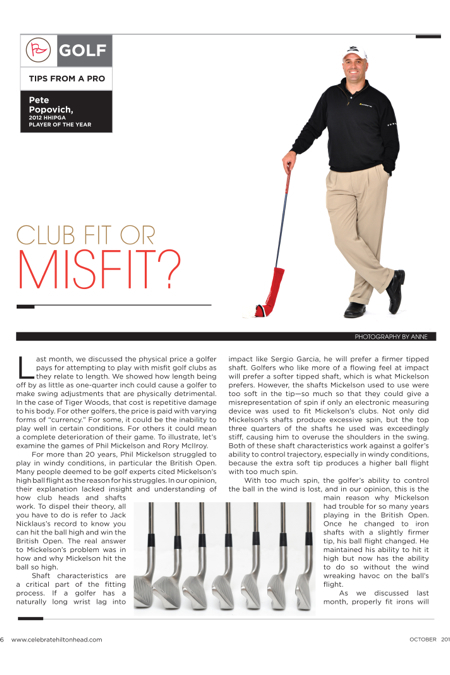 Hilton Head Magazines: CH2/CB2: Tips from a Golf Pro: Club Fit or MisFit? Last month, we discussed the physical price a golfer pays for attempting to play with misfit golf clubs as they relate to length. We showed how length being off by as little as one-quarter inch could cause a golfer to make swing adjustments that are physically detrimental. In the case of Tiger Woods, that cost is repetitive damage to his body. For other golfers, the price is paid with varying forms of “currency.” For some, it could be the inability to play well in certain conditions. For others it could mean a complete deterioration of their game. To illustrate, let’s examine the games of Phil Mickelson and Rory McIIroy. For more than 20 years, Phil Mickelson struggled to play in windy conditions, in particular the British Open. Many people deemed to be golf experts cited Mickelson’s high ball flight as the reason for his struggles. In our opinion, their explanation lacked insight and understanding of how club heads and shafts work. To dispel their theory, all you have to do is refer to Jack Nicklaus’s record to know you can hit the ball high and win the British Open. The real answer to Mickelson’s problem was in how and why Mickelson hit the ball so high. Shaft characteristics are a critical part of the fitting process. If a golfer has a naturally long wrist lag into impact like Sergio Garcia, he will prefer a firmer tipped shaft. Golfers who like more of a flowing feel at impact will prefer a softer tipped shaft, which is what Mickelson prefers. However, the shafts Mickelson used to use were too soft in the tip—so much so that they could give a misrepresentation of spin if only an electronic measuring device was used to fit Mickelson’s clubs. Not only did Mickelson’s shafts produce excessive spin, but the top three quarters of the shafts he used was exceedingly stiff, causing him to overuse the shoulders in the swing. Both of these shaft characteristics work against a golfer’s ability to control trajectory, especially in windy conditions, because the extra soft tip produces a higher ball flight with too much spin. With too much spin, the golfer’s ability to control the ball in the wind is lost, and in our opinion, this is the main reason why Mickelson had trouble for so many years playing in the British Open. Once he changed to iron shafts with a slightly firmer tip, his ball flight changed. He maintained his ability to hit it high but now has the ability to do so without the wind wreaking havoc on the ball’s flight. As we discussed last month, properly fit irons will also have great impact on the ability to hit the driver. If you remember, at this year’s Phoenix Open, Mickelson had one of the best weeks driving the ball in his career and went on to win that event by a number of strokes. Rory McIlroy, with all his youth, talent and ability, is also no stranger to the ill effects of misfit clubs. Changing club manufacturers has been blamed for McIlroy’s decline. It is not the club head design that is the problem; it is how the new club head and shaft work in relationship to one another. Just because you have a forged club head and certain shaft flex with one manufacturer does not mean you will have the same with another manufacturer, even if the flex of the shaft and weight of the heads are identical from set to set. Each club head design has a different center of gravity, length from heel to toe and height from sole to topline. All of these characteristics play a part in how that particular club head will function in relationship to the shaft. Thus, McIlroy’s lie angles, shaft characteristics, and flex/frequency of the shaft would need to be adjusted. These issues should be addressed and, as McIlroy has so well illustrated, they have not. It seems apparent that whoever fit McIlroy’s clubs did not go far enough into detail to fit the clubs and their new characteristics to his natural swing, and for this reason, McIlroy has suffered. All too often, a golfer’s swing problems are thought to be the result of bad mechanics. Many people assume that if the clubs match their last set, they are correctly fit while blindly ignoring the critical details of how to properly fit golf clubs. As a result, golfers are told to work on their swing and that changes take time. In our experience, nothing could be further from the truth. A club adjustment, if done correctly, should take no longer than a few weeks to employ, especially for golfers who play every day like the professionals (for the average golfer, maybe 6-8 weeks). It is when clubs are misfit and the reason for the golfer’s lack of progress (or even his regression) is unknown that a golfer experiences an increase in scores and a decrease in proficiency. At the GPA-HHI, we know and understand the critical details of the club fitting process as well as how to apply them to your specific swing so your game can advance. We do not make adjustments or give prescriptions based on generic forms of fitting. Our fitting system is second to none, and we are more than happy to prove it to you so you can improve and get more enjoyment out of your game. Contrary to popular opinion, the problem is not always the archer; more often than not, the problem is the arrow! To schedule your club fitting and start down the path to lower scores, contact the GPA-HHI at (843) 338-6737, email pete@golfacademyhiltonhead, connect with us on Facebook at Golf Proformance Academy-Hilton Head or watch our latest club fitting video on YouTube at GPAHiltonHead. Broad Creek Marina and Adventures: Fun with a Capital F!